Lincom Group is an equipment provider almost as storied as the industries it serves; quarries, forestries, construction and mining companies are all well-served by Lincom Group’s expertise in the provision of screening and crushing equipment. Based in Queensland and serving a host of domestic and overseas operations — including Papua New Guinea, New Zealand and the Pacific Islands — Lincom Group is a key supplier of brands such as Morbark, Thor Global, Rapid, Pronar, Powerscreen, and several others. This selection presents a high-end group of industrial conveying, crushing and screening systems with myriad mining applications. A recent acquisition for Lincom Group’s portfolio is the new Powerscreen Warrior 2400. Currently being employed in a New South Wales state highway upgrade, this impressive, large-scale machine includes features such as a slide-out conveyor with load-sensing collection conveyor circuit to sense, and subsequently avoid, impending blockages. The biggest machine in the Warrior range, its heavy-duty incline screen (complete with jack legs for screen levelling), as well as its triple-shaft configuration offering numerous screenbox adjustments, prove useful for the quick and effective sifting of aggregate topsoil materials during ore collection. The Warrior 2400 is currently the only triple-shaft configuration scalper on the market; most other screeners use single shaft units, offering lower levels of screenbox adjustment. Weighing 45 tonnes and over 17 metres in length, the Warrior 2400 puts the heavy in heavy duty, and is the biggest machine in the Warrior range; it harbours a 597 litre fuel tank suitable for 12-hour shifts, and its screenbox measures 6.1 x 1.8 metres on both the top and bottom deck, as opposed to its competitors, which generally us smaller bottom decks of 5.4 by 1.8 metres. In operation since 1994, Lincom Group is the premier distributor of crushing and screening equipment in Oceania. In recognition of Lincom Group’s professionalism, the company has won several awards from Powerscreen, the most recent being the Powerscreen Regional Dealer of the Year Award 2017 (Australia and Asia). Watterson believes that the group has gone from strength to strength over the last few years. “The company is growing with the quarrying and mining market that is back in full speed. We are focusing our efforts in our after sales support and spare parts, we want to be there to support our customers in all the life cycle of their machine,” she said. Lincom Group also offers a variety of top condition used machines and spare parts for its brands, stocking and distributing genuine parts from brands such as Rapid, Morbark, Thor Global and Powerscreen. For crushing and screening equipment that runs into trouble after extensive use, Lincom Group provides everything from new engine components, plates and HRC couplings, to hydraulics, rollers, hammers, mantles, meshes, springs and many more new parts through Lincom Group Spare Parts, to ensure maximum customer satisfaction. Lincom Group also maintains an online inventory database for all its locations and major suppliers, enabling access to real-time parts information both locally and overseas, reducing potential delays during the ordering process. Offering a rapid response parts service, Lincom Group ensures mining machines are up and running as fast and efficiently as possible in order to reduce downtime and, as a result, reduce lost time from breakdown and wear. 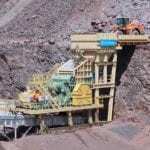 For miners that need access to cutting-edge crushing and screening technology, Lincom Group is the go-to supplier.